Here's what happens when substance meets smooth. This oatmeal brown ale defies traditional categories. Bender begins crisp and lightly hoppy, complemented by the velvety sleekness oats deliver. Belgian and British malts usher in cascades of cocoa, coffee, carmel and hints of vanilla and cream. An easy-drinking ale with many layers of satisfaction. Sweet aroma, dark fruit, slight aroma of dark malts. Deep ruby with rising bubbles topped by a 1/2 inch tan, thick head, leaving nice lacing as it slowly settles. Thin feel. Mild taste with a subtly bitter, dry finish (despite the sweet aroma) that hardly lingers at all in the aftertaste. Taste is also subtle: dark fruits, mostly, touch of roasted malts. Very middle-of-the-road brown ale. Easy drinking. OK, but far from outstanding. 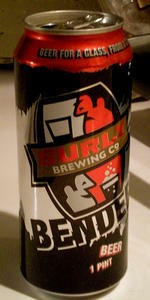 I bought it because it was Surly's first beer, I've never tried it, and Surly is stopping canned distribution. This beer is all about subtlety, subtle aroma, subtle taste, subtle hops, subtle malts. In summary: ordinary tending toward macro level. Ratings here must reflect the Surly mystique rather than this actual beer. This is a nice beer, but only nice. Good for an evening at the pub, but not to seek out. I am astonished, given the ratings here, how pedestrian and mediocre this beer is. It is better than Newcastle, but only just. Understandable why Surly is making it tap only. Appearance - Served up from a can, standard pint pours dark cola brown with beautiful ruby highlights when held to light. Light tan, finger width head that holds firm until devolving to a thin, consistent layer of suds, thickening up quickly around the edges. Smell - Mild aroma, with hints of chocolate, oat, brown sugar and floral hoppiness. Taste - Flavor profile is mostly soft, but also assertive with floral and lesser citrus hops and with a fair roasted edge. Decent chocolate notes emerge mid-taste and follow through into the finish. Some cream and caramel. Finish is mostly balanced, edging slightly toward sweet with the accumulation of said flavors, and its a beautiful, harmonious blend. Mouthfeel - medium-bodied with low, bubbly carbonation. Creamy texture makes this an easy drinker with a slightly dry finish. Overall - I had the coffee version earlier today and it makes me question why they would do that. The former isn't bad at all, but this is far better. Soft, easy drinker with a surprising depth in the flavor profile. One of the best browns Ive ever had if I'm being honest. Dark brown color with amber hues and light brown head. Aroma has toasted malt, some hazelnut, light liquorice and some red fruits. Taste has nice toasted malt, some caramel, sweet coffee, nutty biscuits, quite a lot of flavors. Medium body and carbonation. Really easy drinking yet tasty and complex.